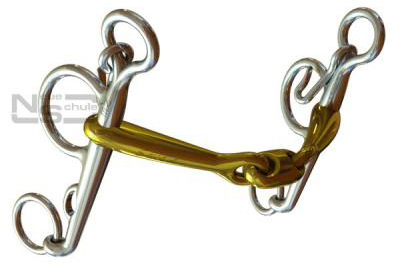 << Back Lozenge Pony Pelham 10mm 4"
Very beneficial for ponies that lean in a standard Pelham. Innovative,lightweight, elegant cheek design - very popular in the show ring. When a contact is taken the NS Tranz Angled Lozenge rotates gently down onto the centre of the tongue (the sweet spot), enhancing feel and responsiveness, thus a higher level of communication is achieved. This NS Pony Tranz Pelham is designed to be extremely comfortable, promoting a rounder outline, encouraging more freedom through the shoulder. Sourced for control and self-carriage, the NS Pony Tranz Pelham usually gives more feel and response as opposed to a standard solid mouthpiece that often encourages fixing and blocking, culminating in a ‘wooden’ feel. All of our pony cheeks are scaled down in proportion with our neat pony mouthpieces.